High-end or low-end, sometimes new shoes cause all sorts of pinching problems. Making this problem worse, one usually does not know to expect pinching until it's too late and she's out on the street. A couple weekends ago, I put on a new pair of flats only to find myself nearly unable to walk after just 20 blocks. I had left my trusty blister-blocker at home, so I had no protection from the pinching and rubbing, and managed to get terrible blisters faster than I've ever gotten them before. In fact, they were so bad that they ruined my plans -- I just couldn't hobble around the museum in so much pain. What a disappointment. Once home, I decided it was best to fix the problem shoes right away so that they could be worn in the future. So, after caring for my small but painful wounds, I set to work stretching the offending footwear. If you ever danced in point shoes, you might remember the many ways ballerinas stretch their new shoes to make them form to their feet. I distinctly remember years of holding new toe shoes over pots of boiling water, trying to hold them close enough to soften the leather in the steam, but just far enough away to keep from burning my fingers in the process. While I've considered this method for regular street shoes, I'm glad I found something easier to use instead. Years ago, when I had shoes that pinched, I would just take each pair to the cobbler. It is pretty amazing that (depending on the leather) they can stretch shoes and boots quite a bit. I once even bought a pair of expensive boots that were too tight in the calves to zip knowing that the cobbler would be able to stretch the soft leather enough to make them zip comfortably. The only trouble with this plan is that often shoes will shrink again after some time of not being worn. So one day, after yet another pair of pinching shoes, the cobbler suggested I buy a liquid shoe stretch. He told me that if I used it on the inside of the shoes he had just stretched for me, they would stay stretched for a longer period of time. Ever since, I have been in love with this inexpensive and effective product. 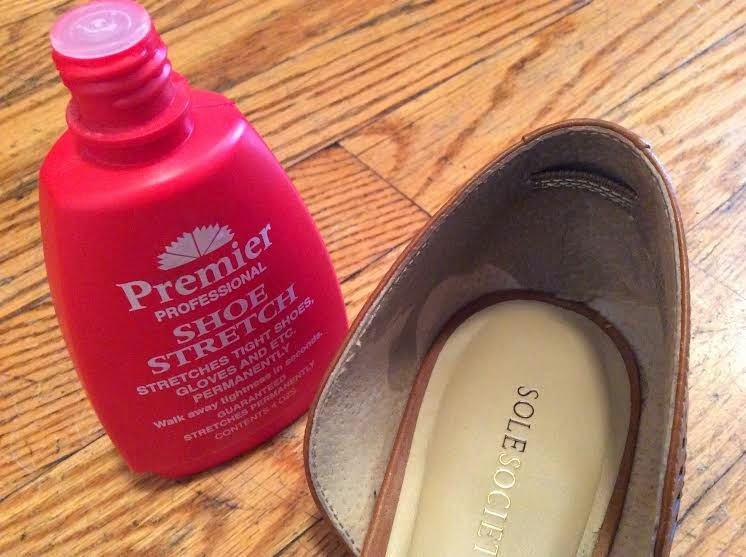 I bought Premier Shoe Stretch all those years ago, and it's really simple to use -- just add some of the liquid to the area of the shoe that pinches, put on the shoes, and head out. By the time the liquid dries, the shoes have stretched a little from the movement of walking combined with the liquid shoe stretch. The process can be repeated as many times as necessary, and it works well enough to keep some shoes from ever having to visit the cobbler. -While the liquid will not discolor most leather, it's safer to only use it on the inside of the shoe, and not the outside, if possible. The off-chance that a pair of shoes could be stained and rendered useless is just not something I want to take my chances with. Using it inside the shoe, I've stretched everything from Prada heels with beautiful, soft leather to $35 flats with cheap, unmalleable leather, and not seen a stain seep through. -If even more stretch is needed, and wearing them around the house just won't work, it's easy to stretch them at home just the same way the cobbler does. 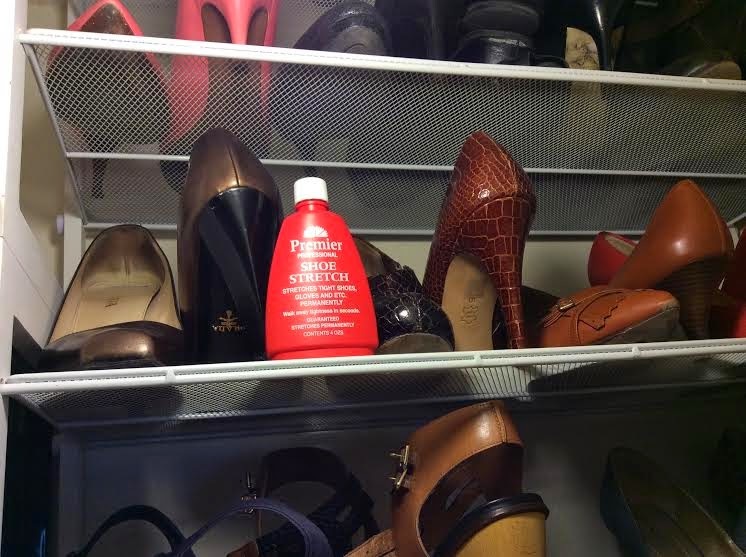 Just put the liquid in and stretch the shoes using shoe stretcher. Repeat as many times as necessary. I haven't needed to use a wooden shoe-stretcher yet, but after my recent blister-filled mishap, I might be investing in a pair of shoe trees soon. With both tools at my disposal, I may never need to take another pinching pair to the cobbler again.